The majority of the information in this feature is taken from an article by David Tubby entitled "The History of the Wellesley Recreation Ground" in the 2000 edition of 'Yarmouth Archaeology', the journal of the Great Yarmouth & District Archaeological Society. The permission of the author should be obtained for any further use. In the late 1800s both the North and South Denes areas of Great Yarmouth were undeveloped and used for sports of all kinds. 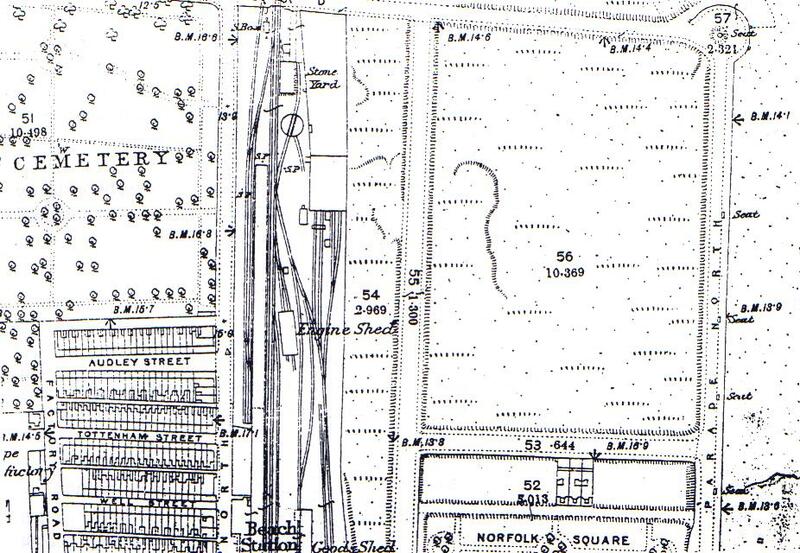 In September 1885 the town council proposed that about seven and a half acres of the North Denes be set apart as a recreation ground (see map 1). During 1887, the council agreed to fence the ground with oak palings, and wrought iron gates were ordered, the one at the south-west corner remaining to this day. In April 1888, a circular cinder bicycle track was laid, one third of a mile in length and plans were produced for banked corners to the northeast and northwest which however were not added until 1893 (surviving to this day as grassy mounds). The ground was opened on 6th August 1888 (a Bank Holiday) by the Town Mayor and the ceremony was followed by a sporting extravaganza: an estimated crowd of 3000 paid 1/- (5p) each for the privilege of watching various races. In the spring of 1889 it was agreed to turf the entire area within the cycle track and three cricket pitches were laid here, the Town Club having priority use of the main (centre) pitch. The first match to be played on the ground took place on 8th June 1889. In the same year, the council agreed to lay out a concrete tennis court to the north end. A public meeting of 15th April 1889 met to discuss the Recreation Ground Rules. In their final form, these rules covered everything from charges and opening hours to the banning of preaching, public speaking, betting and gambling! A copy of the rules was posted in the ground. In the spring of 1889, 350 feet of deal seats were purchased and fixed. In the summer of that same year it was agreed to erect a structure by the gate for the use of the ground manager who had been appointed earlier in the year. This almost certainly still exists as the small groundsmans hut just inside the SW gate. In October 1889, it was agreed by the council to construct another tennis court, this time at the south end, together with a small pavilion for the accommodation of the tennis players; this building survives today and in recent years was used by the Wellesley Bowls Club though it is now derelict. It is probable that the first football match to be played at the ground occurred on Friday 11th April 1890 when a Yarmouth representative side met the County Captain's Team during their annual tour. Improvements during that summer included a further five (grass) tennis courts at the south end, the installation of turnstiles and the fixing of a further 200 feet of seating. 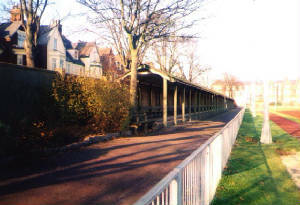 By now it was being recognised that there was a need for a grandstand on the east side from which to view the sports, and in September 1891 the Recreation Committee of the council recommended the erection of a grandstand, dressing room and refreshment pavilion at an estimated cost of £1000. The stand was duly opened on Whit Monday, 11th June 1892 when a combined Athletic and Cycle sports meeting was held, attended by a crowd of some 4200. This is the stand which is still in use (albeit on a restricted basis due to modern fire regulations) and which is now recognised as the oldest surviving football stand in the world (see photo 1). In 1897, the Beaconsfield Recreation Ground to the north came into use and to avoid confusion was referred to as the New Recreation Ground, the Wellesley being known as the Old Recreation Ground; it was not until 1908 that they acquired their present names. When Great Yarmouth Town Football Club came into being in 1897 the club spent its early seasons on the Beaconsfield, before finally being granted permission to use the Wellesley for the 1901/02 season: the club treasurer reported at the 1902 Annual General Meeting that, "Had the committee not been able to reduce their expenditure very considerably in consequence of being allowed the use of the Old Recreation Ground, the balance sheet would not have been.....satisfactory." The club was granted use of the ground every Saturday and allowed to charge gate money on condition that 10% was paid to the council. In these early days, the clubs use of the ground was frequently curtailed in the first week of April to allow sufficient time to prepare cricket pitches. In 1907, a new gate was constructed in the north east corner at a cost of £5! In 1910 the Recreation Committee agreed to the planting of trees on the east side to complete the perimeter plantings. In 1908 the Borough League Wiltshire Cup committee was granted permission to use the Wellesley for the Easter Monday morning playing of the final of the competition and this has remained the traditional day and venue for this final up to the present time. In 1913 the Recreation Committee recommended the turfing over of the cycle track which had fallen into disuse but as a result of a petition the Council reconsidered and instead authorised the spending of £60 on repairs to the track! The first important post-World War One decision affecting the Wellesley was to replace the perimeter fencing with a concrete block wall which still remains today as the east, south and west boundaries of the ground. Other renewals and refurbishments were needed, and the Football Club committee wrote to the council before the start of the 1919/20 season urging repairs to the dressing rooms, which work was duly carried out. Iron railings with concrete posts were added to the outside of the cycle track near the grandstand. In 1923, Norfolk County Cricket Club entertained the MCC on 6th and 7th July, and later that year, on the suggestion of the Football Club, the concrete steps in front of the grandstand were constructed, along with a urinal behind the stand; this latter is still in use, though not to be recommended! A pay box and turnstile were also erected at the south west gate (in Wellesley Road itself) and in 1924 a concrete bath was installed in the dressing rooms. Rugby returned briefly in 1923/24 and 1924/25, the local brewery established a bowls competition in 1924, and dog racing was also added to the growing list of sporting attractions in 1926. The next major ground improvement was completed in 1931 when the west side concrete standing and shelter was completed; this has since remained relatively unchanged (see photo 2). Schools were making good use of the facilities, several holding their Sports Days at the Wellesley, while the Great Yarmouth Schools Football Association started to hold matches there in 1929. The cricketers, meanwhile, were experiencing difficulties and the Town Club moved to the recreation ground at Southtown in 1936. The presence of American airmen in the town during the Second World War led to the playing of baseball on the Wellesley, while at the end of the War a United Service of Thanksgiving was held on the ground following the declaration of peace in Europe; on 12th May 1945 a Victory Sports Meeting took place. Post-war, money was found to repair the dressing rooms and install electric water heaters and a sum was put aside to repair the cycle track yet again. However, cycling was destined never to take place at the Wellesley again, and this activity was re-established at Gorleston Recreation Ground. The summer of 1947 saw a host of attractions at the Wellesley, including a Charity Football Match between Norwich City and Ipswich Town in aid of Yarmouth's General Hospital. In 1948, to allow for the construction of the electricity sub-station (still there) in the north east corner, the original wicket gate was replaced by a larger wooden structure which remains to this day and is now the main entrance on match days. The grandstand was by now sixty years old and showing its age; repairs to the gable ends were carried out in 1951 and two years later the stand was re-roofed in corrugated asbestos sheeting. Archery, flower shows and horse-jumping were added to the ever-growing list of events staged at the ground, but the biggest crowd ever seen at the Wellesley was that at the FA Cup 1st Round match between Great Yarmouth and Crystal Palace on 21st November 1953 when 8944 watched the Bloaters win 1-0; additional terracing was provided by an arrangement of fishboxes behind the south goal. Up until 1963 athletics races had been held on a grass track but in that year the council agreed to the construction of a cinder running track and it was first used for the Norfolk AAA championships on 30th May 1964. The same year saw the erection of the present Tea Hut for £1800; originally for the entertaining of visiting football teams and officials, it is now used as a a refreshment facility by both the Football Club and the Athletic Club which uses the ground for training purposes and summer meetings. Variety Artistes charity football and cricket matches commenced in the early sixties, featuring stars from the summer shows in the town and these continued well into the seventies. The Football Club were one of the first promoters of these events. Disaster struck on Sunday 16th September 1967 when a fire broke out in the grandstand, gutting the treatment room and adjoining dressing rooms. Part of the stand remained useable for spectators though the teams had to change in the North Drive Bowls Pavilion for several weeks until repairs had been effected. The seventies saw Father Christmas land by helicopter on several occasions, and television's "Its a Knockout" also made use of the facilities. The cinder running track had experienced flooding problems since its construction, and in 1974 £3000 was spent on improved drainage. Other improvements for athletics purposes followed in the succeeding years. Many years of endeavouring to provide a cricket square in the middle of the pitch came to an end in 1978 when Old Yarmouthians who used it as their home pitch removed to the Beaconsfield ground. In 1979 the Football Club received permission to erect a Clubhouse at the north east corner of the Wellesley; the building, which had an entrance onto Sandown Road and was granted a licence to sell alcohol, was constructed entirely by club members. An initial request by the Football Club for floodlighting in September 1981 was turned down but after further consideration and the offer of grant aid to the sum of £10000 from the Sports Council the town council finally agreed and the lights came on for the first time on 7th October 1983 when the Bloaters played an Ipswich Town side. 1982 saw the demise of the grandstand refreshment rooms and the area reverted to storage space for the Football and Athletic Clubs. That part used by the Football Club became a hospitality lounge for the entertaining of visiting officials in 1992, the earlier building to the north of the stand becoming a Tea Hut for the use of general spectators. In the aftermaths of the Bradford fire and Hillsborough disaster, the Wellesley's spectator facilities came under scrutiny. The grandstand was closed in September 1985 until rubbish had been removed, No Smoking signs erected and arrangements made for the use of safety stewards on match days: to this day announcements are made at every match for which the stand is open informing spectators of the smoking ban. Fire-resistant linings were added to the rooms under the (mainly) wooden grandstand in 1986 at a cost of £5555. As a result of the Taylor report, a small section of the west stand was removed to act as a fire break and to deregulate it from legislative requirements. September 1986 saw the opening of a floodlit artificial sports surface and in July 1988 a new public toilet block was constructed at the north end of the ground, near to the site of a toilet facility originally built in 1889. In 1989 an all-weather athletics track was built at a cost of £210000 - the largest single capital expenditure project at the ground to date; the track was opened on 5th August 1990 by Olympic sprinter John Regis. The 1990s saw no major developments of the ground; however, thanks to the efforts of David Tubby of the Great Yarmouth Archaeological Society and of David Holland, both Football Club supporters, an application was lodged for listed status in respect of the grandstand, the bowls pavilion and the gatehouse. The application eventually succeeded and in May 2002 the buildings were judged to be of special architectural and historic interest, and added to the Grade 2 list. After the discovery in November 2007 of structural defects, the Grandstand was closed to the general public until further notice. It is estimated repairs will cost in the region of £300,000.